CENTRE STAR LODGE received an award from the Most Worship Grand Master Brother Robert Reed, Sr. at the District 8 meeting on March 30th. It recognized our Lodge for the highest average amount of money per member donated to the Tennessee Masonic Widows and Orphans Fund in District 8 during 2018. Brothers this is something to be very proud of! Centre Star will be celebrating our 150th birthday in 2020. 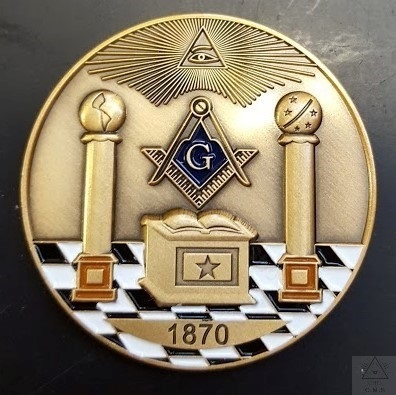 The coin pictured above is available for purchase to celebrate this amazing milestone. Price is $8.00. See the Secretary to purchase. These coins will be made available at the BBQ. We have about 120 left so get a couple for keepsakes. This old Lodge was formed in 1870 and has had several different homes. Perhaps it is fitting that the longest it has stayed anywhere is the present location, in an old building that was constructed in 1873. Though it looks different from the church days, the Lodge hall is the old Alex Green Methodist sanctuary. Many souls have been saved in this building as well as many men becoming better people because of what it houses. Thank GOD for both. This year is our 50th Annual Bar-B-Que at Centre Star Lodge. Be thinking of ways we can improve this fund raiser and include as many members as are willing to work! Centre Star Members. Email Addresses at "centrestar.org" are now available. Send an note to the webmaster if you are interested.